A look at how the control of the media has helped plot the Russian political trajectory from dictatorship and back again. [Ostrovsky's] sparkling prose and deep analysis provide not only a sweeping tour d’horizon of Russia’s malaise, but also a description of the process by which anti-modern ideas combine with postmodern actions to buttress the country’s authoritarian and kleptocratic system. While many previous authors have attempted detailed reconstructions of this history, Ostrovsky takes a different approach, focused more on why events turned out as they did. The reader feels as if on a grand tour, with Ostrovsky at the elbow. His interpretations are erudite, taut and mostly right...Ostrovsky sees Russia as a tangle of ideas, and he pays special attention to how the thinking of the day was reflected on television and in other media. He is particularly good at hearing the nuances and seeing how identity, ideology and personal experience undermined hopes for democracy and reform. 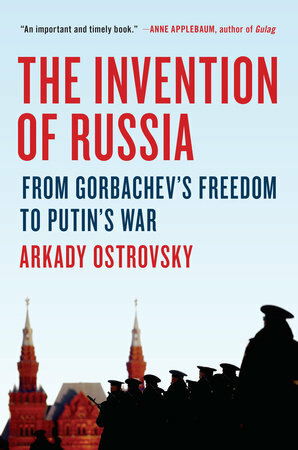 Anyone who has spent time in Russia over the past 30 years should be deeply grateful for Arkady Ostrovsky’s fast-paced and excellently written book ... Mr. Ostrovsky’s account of the progression of invented Russias, political battles and changing realities is never dull or academic. A serious student of theater until he took up journalism, he fills his book with anecdotes, conversations and a delightful cast of Russian characters ... Mr. Ostrovsky provides a much needed, dispassionate and eminently readable explanation of how it happened. What did you think of The Invention of Russia: From Gorbachev's Freedom to Putin's War?